Chlorine will kill your shrimp. Always treat water or use distilled water. Don't put other animals in your shrimp tanks. Turtles and fish will eat small shrimp. 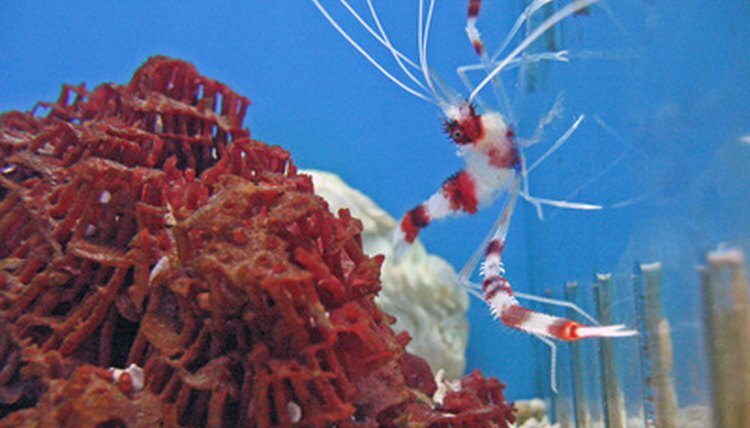 Shrimp are popular additions to aquariums, but they are also a popular cash crop. Shrimp prices have always been high compared to other seafood items. Many people raise shrimp at home, in small tanks or large ponds, for their own table or to sell as a seafood crop. With a little time and effort, you can grow your own shrimp, using some easy guidelines. Purchase young shrimp form a specialty retailer. Buy 30- to 60-day-old shrimp to guarantee that you're getting established, healthy shrimp. Start your shrimp tanks at the start of June to take advantage of the shrimps' summer growing season. Set up your shrimp tanks. Allot 10 shrimp per 20 gallons of water to give shrimp adequate personal space. Set up a pump and filter system; line the aquarium with substrate and provide rocks and plants for shrimp to hide. Put the heater and thermostat in the aquarium, and fill it with dechlorinated or distilled water. Turn on the pump, filter and heater, and give the tank 24 hours to settle. Monitor the temperature of the tank and adjust the heater accordingly. Keep freshwater shrimp at a temperature of 76 to 88 degrees. Temperatures of less than 60 degrees or more than 97 degrees will kill shrimp. Put the shrimp into the tank. Feed the shrimp fish or shrimp food once a day and maintain the water temperature and clarity. Shrimp will grow all summer and be ready for harvest in September or October.